Yesterday's post was the 1,000th post on the website. I remember when I first started the blog back in January 2006 that I was so excited about the opportunity to think out loud about personal finances. I knew that I would use those writings to begin a book. I have seen a lot of people burn out on blogs over the three years because of "lack of something to say" or "no time" or "Twitter". All of these were valid reasons for them, but I am three years into this thing and have even more stuff to write about! I am PUMPED and FIRED UP about what is going on with this crusade, and I can not WAIT to see what happens next! 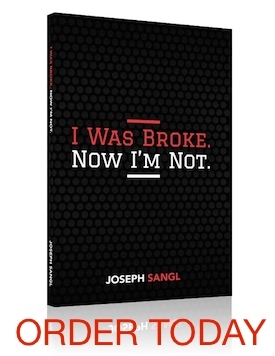 Thanks for being a loyal reader of JosephSangl.com. It is my hope that the content shared on this page and the Next Steps page is helping you become the best manager possible of the money you have and will receive. So, let's throw a little celebration, shall we? Since you all are the reason we have been able to teach and speak to tens of thousands over the past three years, I want to give away some resources. We will be giving away copies of I Was Broke. Now I'm Not. and it's related I Was Broke. Now I'm Not.Group Study Guide . Here's how this 1,000th Post Celebration work. I want you to give the resources away to someone else. Send my team a note using THIS LINK HERE telling us who you want to give these materials to AND tell us WHY you want them to receive the materials. The first five people that send in their gift recipient AND tell us WHY they chose them will win. You have just read post number 1,001. We will be celebrating post number 2,000 before you know it!